Why do some children thrive, and others struggle? New research indicates that the seeds for adult success are actually planted in the toddler years, ages two to five. 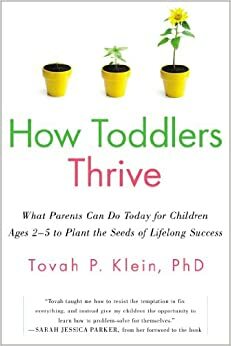 In How Toddlers Thrive, child psychologist and director of the renowned Barnard Center for Toddler Development Dr. Tovah P. Klein cracks the preschooler code, revealing what you can do to help your toddler grow into a fulfilled child and adult—while helping you and your toddler live more happily together, every day. Dr. Klein’s research and firsthand work with thousands of toddlers explains why the toddler brain is best suited to laying the foundation for success. New science reveals that drivers such as resilience, self-reliance, selfregulation, and empathy are more critical to success than simple intelligence. Dr. Klein explains what you can do today to instill these key qualities in your toddler during this crucial time, so they are on track and ready to learn when they enter school at age five. How Toddlers Thrive explains why the toddler years are different from any other period during childhood, what is happening in children’s brains and bodies at this age that makes their behavior so turbulent, and why your reaction to their behavior—the way you speak to, speak about, and act toward your toddler— holds the key to a successful tomorrow and a happier today. This provocative new book will inspire you to be a better parent and give you the tools to help you nurture your child’s full potential. Stop fighting with your child and start enjoying every minute of your time with them . . . while planting the seeds of happiness and success that will last a lifetime. While I no longer have toddlers, I have to say that this book was quite extensive in its' approach to how parents should approach and support their young children and I wish I had this when my kids were younger. This was a well researched book and one that really engages the reader in the learning that it provides. The book was well written as well and gives practical tips on what parents can do to best support their children through their development which is exactly what new parents want and need to know. I highly recommend this to all parents of young children, as it will open your eyes to the great scheme of things as it comes to the future of your kids. The Bonefish Grill Tempts Your Tastebuds! Book Review - Back to School, Picky Little Witch! Book Review - Just Paint It! Book Review - Ninja, Ninja, Never Stop!